There are many different species of ants, but when it comes to ants that are found in households, we are usually talking about the carpenter and black ants. 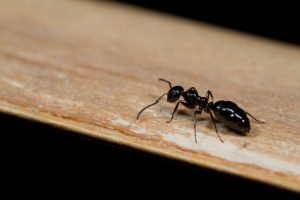 Black ants, also known as black garden ants, can cause a lot of frustration with homeowners because they are difficult to eliminate once they settle in the house. A single colony of these ants can have more than 2,000 active black ants. Black ants are active both at night and during the daytime. Gardens and houses are their favourite habitats even though some of them are found in forests too. These ants can be found in Europe and in some parts of North America too. The elimination of black ants is not a simple task. When they are in our homes they usually nest in cracks in walls, woodwork, in basement walls and under carpets and rugs. In the garden, they are found in concrete cracks, mulch, trees and under rocks too. It can be difficult to locate the nest and they are also very resilient creatures. Another reason why it’s difficult to get rid of these ants is the fact that they can use almost anything as food. Black ants love vegetables, sugar, protein, plants and they eat other insects too. In addition, they eat honeydew that comes from scales and aphids. They have a very good sense of smell and they can locate food sources without any problems. The food is usually brought to their nest where all of them eat. Springtime is their favourite season because this is the time of the year when they can leave their nests more frequently and for a longer period of time. They are looking for new and fresh food in spring. This means that if you notice more black ants at this time of year, this doesn’t necessarily mean that your home is infested, they’re likely to be about anyway. However, if you notice them in large numbers in your property, then there’s a good chance that you have a nest somewhere. If you are experiencing an ant infestation and need help in locating the nest and eradicating them, please contact us now.